The globalisation debate too often gets simplified into a claim that working people in Western countries have seen their incomes stagnate in recent decades. But the evidence doesn’t support this simplistic case against globalisation. Yes, trade and migration bring with them challenges, but a more equal distribution of growth also depends on domestic policy choices. Dit is een voorpublicatie uit het nieuwe nummer van idee, dat op 17 december verscheen. Abonneer je nu en ontvang als een van de eersten het nieuwe nummer. Long before Donald Trump’s surprise election victory, it had become fashionable to say that globalisation has led to stagnant living standards for working and middle classes of the developed world, leaving national governments powerless to deliver rising incomes and explaining rising political dissatisfaction with the status quo. These arguments are dangerous – not just because, in this simple form, they are wrong. Living standards in many developed countries have been squeezed at many times. 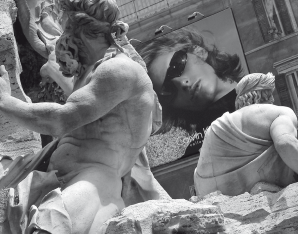 But we should beware of concluding that responsibility for that rests entirely with a faceless force called globalisation – that if reversed would put right all that is wrong with the world. This question is not new. But the recent US election, the British decision to leave the European Union, and opposition to trade deals like the EU-Canada ‘CETA’ agreement, show that the issue has not just risen up the agenda – it is becoming the agenda in much of the developed world. Crucially this is a debate in flux – and where it settles will be important for our politics and economics for decades to come. In the face of popular frustration, progressives are rethinking where they stand on questions from trade to migration. President-elect Donald Trump has reversed overnight the traditional Republican advocacy of free trade, arguing that “this wave of globalization has wiped out totally, totally our middle class”. With Trump, the proposed trade deal between the US and the EU now seems as doomed as the Trans-Pacific Partnership, but there was growing debate too within the Democratic party about the very desirability of free trade. And both French president François Hollande and German vice chancellor Sigmar Gabriel had adopted significantly tougher rhetoric against the same trade deal. In the UK, the British Labour Party faces the challenge of redefining its vision of Britain’s role in a post-Brexit world. Jeremy Corbyn seems to view the Single Market as a ratchet to drive down labour market standards, rather than as the collective mechanism of relatively rich European countries for avoiding exactly that. And in the Netherlands Lilianne Ploumen, the Minister for Foreign Trade and Development Cooperation, in an interesting speech reflecting on the challenges of globalisation recently stated that globalisation had resulted in “a huge group of people who haven’t seen their lives improve much. Some of them have even seen their incomes drop. These [people] form the lower-middle classes in Europe and North America”. But is it right that globalisation has coincided with income stagnation for working people in the developed world? These are global questions, so answering them requires global data. The seminal contribution in that regard comes from Christoph Lakner and Branko Milanovic, bringing together an unprecedented collection of information on income levels across countries and using it to examine the period of ‘high globalisation’ from 1988 until the start of the global financial crisis in 2008 in a series of articles, and in Milanovic’s case a major book. These run to hundreds of thousands of words, but one chart has made the work especially well known. The so-called ‘elephant curve’ has generated sufficient excitement to be described as possibly “the most important chart for understanding politics today”. This chart (compared to an elephant, with the tail on the left representing the poorest in the world and the trunk on the right the richest) shows how incomes have grown between 1988 and 2008 for each part of the global income distribution. The key conclusion many have drawn from it is that, while these two decades saw good income growth for many (think China and the global top 1 per cent), the working and middle classes of the developed world saw precisely zero income growth. It is this shocking conclusion that has made the curve about as famous as you can get while being an economics chart rather than a film star. The only problem – as a Resolution Foundation report shows – is that the conclusion is wrong. There are two key points worth emphasising – the importance of demography and which countries’ experiences we’re talking about. 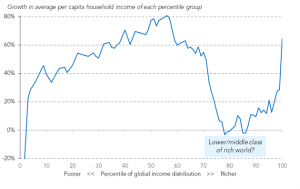 The elephant curve compares the average income of, say, the top 1 per cent in the world in 2008 with the top 1 per cent in 1988, and so on for each per cent of the global income distribution. But crucially who is in each per cent changes during that period. This matters because population growth has been much faster in poorer countries, giving us relatively more poor and fewer rich people in the world. This drags down the income growth reported in the elephant curve significantly but tells us precisely nothing about what has happened to working people in Rotterdam or Redcar. If we correct for this fact, we find that incomes of the working/middle class of the developed world rose by around 25 per cent rather than stagnating. 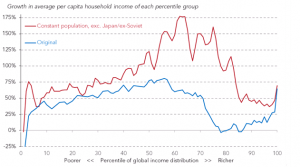 If we then dig into the big variation between individual countries, it becomes clear that even this weak income growth is not a universal feature of low and middle income people in developed countries, but instead driven by the experience of Japan (where the data appears to be plain wrong) and ex-Soviet satellite states (who faced big income falls as the Soviet Union collapsed). These income changes are important, but again tell us very little about income levels in Western economies. Indeed, once we exclude those countries from the analysis the income growth towards the top of the distribution rises again to around 50 per cent over the period, or around 2 per cent a year, a long way from stagnation. It is true that the US has seen very poor income growth, with the rich benefiting the most from what limited growth there was. But that experience is to quite a degree one of US exceptionalism. Variation amongst the developed world should make us reluctant to accept that this is inevitable or simply driven by global forces. 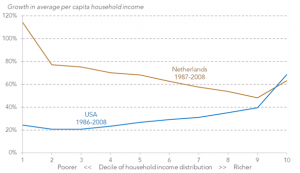 In fact in the Netherlands income growth over this particular period was both stronger and much more equally shared. Now none of this means that globalisation hasn’t brought challenges. While the data above is about averages, substantial increases in international trade (not to mention technological changes) have translated into much tougher competition for particular companies, cities and workers. Recent research also shows that in both the US and the UK workers in sectors most affected by Chinese imports had worse employment and wage experiences than others since 2001 – when the world’s most populous country joined the World Trade Organisation. That makes the case for thinking hard about the rate of change of big shifts in trade patterns, but it is a very different thing to asserting that globalisation always delivers zero income growth for working people. So both those saying globalisation automatically benefits everyone and those saying that developed world middle classes have seen no income growth are wrong. Perhaps most crucially, where individual countries lie in between those extreme positions is to a significant degree down to policy choices. 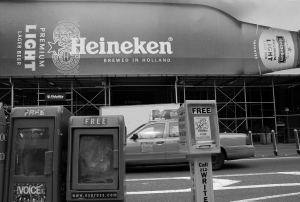 The loss of jobs and income growth caused by the financial crisis, the volatility of the housing market, the degree of redistribution through the tax and benefit systems, minimum wage policy: these have all been crucial determinants of living standards in both the UK and the Netherlands and have little to do with trade policy. To fetishise globalisation as the cause of all our ills is to let too many domestic policy makers off the hook for decisions they make, for problems they leave unaddressed and for the lower incomes working people experience as a result. Minister Ploumen suggested that we should seek a global distribution of growth more akin to “the friendly Rotterdam tapir” than to an elephant – with “a much smoother back, a much more modest trunk” meaning stronger income growth for those on lower incomes. She warns that “we either make globalisation work for everyone, or we get nationalisation – which works for no one.” But we need to learn the right lessons from the past, recognising the challenges of openness, but not thinking it is the cause of all our evils. We must do more to share income growth, not least geographically, and recognise that wider domestic agendas are at least as important and within domestic control. Someone else might be responsible for the past, but we control at least a decent chunk of our own future. We might as well shape it. Torsten Bell and Adam Corlett both work for the Resolution Foundation, an independent British think-tank working to improve the living standards of those on low and middle incomes. Dit is een voorpublicatie uit het nieuwe nummer van idee, dat op 17 december verschijnt. Abonneer je nu en ontvang als een van de eersten het nieuwe nummer.